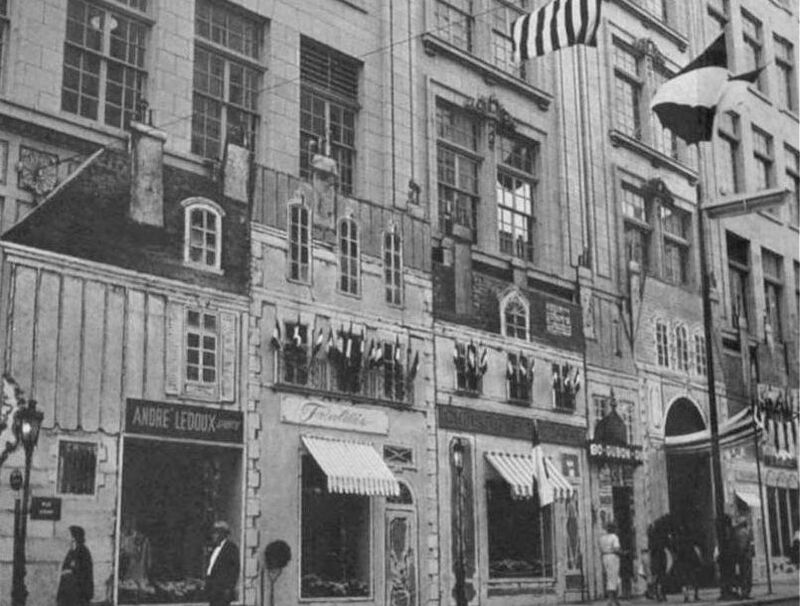 In 1957, Neiman-Marcus presented their very first Fortnight celebration — a tribute to France, which included filling the department store with French products and couture, hosting celebrated fashion icon Coco Chanel on her first visit to Texas, promoting French culture and tourism, and even elaborately decorating the outside of their downtown building to resemble the Rue du Faubourg Saint-Honoré. It was a huge success, and it became a much-anticipated annual event in Dallas. The Fortnights became very popular and were celebrated city-wide. There were all sorts of non-N-M events around town that tied in with whatever country was being honored that year (plays, art exhibits, lectures, etc. ), and businesses soon realized that it was easy to share in the Fortnight spotlight and momentum by either blatantly or subtly customizing their advertisements to have a bit more international flavor for two weeks every year. As I have a personal connection to The Aldredge Book Store, I’ll use them as an example. The ad below is one of the earliest examples of a Fortnight tie-in ad. Sawnie Aldredge, the original owner of the store, was an enthusiastic Francophile, and Stanley Marcus had been a regular customer from the day the doors opened in 1947. It seems likely that the two would have discussed the event at some point, and this type of piggy-backing seems like a mutually beneficial sales opportunity made in heaven. Even though N-M was not specifically mentioned, readers of the ad would certainly have known of the connection to the well-publicized promotion. As the Fortnights became more and more popular, everyone in town began jumping on the bandwagon, and between 1957 and 1986, the whole city went crazy for one specific country for two weeks every year. It was great. And I still miss them. Neiman-Marcus “France Comes to Texas” poster by Raymond Savignac. Photograph of the Frenchified facade of the N-M building from Minding the Store by Stanley Marcus (originally published by Little, Brown in 1974). Aldredge Book Store ad from October, 1957. One of my favorite pieces of ephemera from this first French Fortnight is a lavish advertisement insert that appeared in the October 1957 issues of American and French editions of Vogue. The 30-plus page insert has been scanned by SMU (it is in the collection of Stanley Marcus’ papers at the DeGolyer Library). It is great. If you are interested in fashion advertising of the 1950s, you’ll enjoy the sophisticated-but-fun-and-frothy art direction, seen in a PDF, here. For an entertaining look back at the various Fortnights (including the year when Mr. Stanley & Co. had to invent a country one year when Australia pulled out at the last minute! ), read “Fabulous Fortnight” by Si Dunn in D Magazine (Oct. 1984), here. And for my previous post on Coco Chanel’s visit to Dallas (during which she attended a barbecue! ), “When Coco Chanel Came to Dallas — 1957” can be found here. This wasn’t an official part of the first Fortnight, but it was a sort of prelude, preceding the 1957 French Fortnight by a month.